A collision domain is, as the name implies, the part of a network where packet collisions can occur. 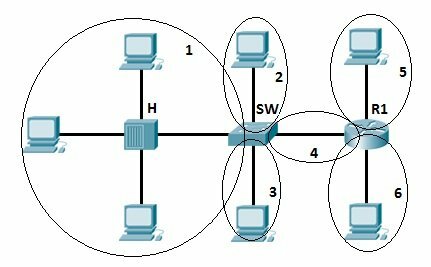 A collision occurs when two devices send a packet at the same time on the shared network segment. The packets collide and both devices must send the packets again, which reduces network efficiency. Collisions are often in a hub environment, because each port on a hub is in the same collision domain. By contrast, each port on a bridge, a switch or a router is in a separate collision domain. We have 6 collision domains in the example above. Remember, each port on a hub is in the same collision domain. 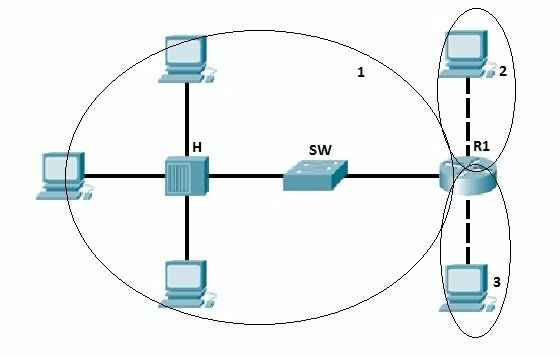 Each port on a bridge, a switch or router is in a seperate collision domain. A broadcast domain is the domain in which a broadcast is forwarded. A broadcast domain contains all devices that can reach each other at the data link layer (OSI layer 2) by using broadcast. All ports on a hub or a switch are by default in the same broadcast domain. All ports on a router are in the different broadcast domains and routers don’t forward broadcasts from one broadcast domain to another. In the picture above we have three broadcast domains, since all ports on a hub or a switch are in the same broadcast domain, and all ports on a router are in a different broadcast domain.